Growing up in Osijek on the borders of the Austro-Hungarian empire, Vienna was the centre of Nemon’s cultural universe. Nemon became interested in Freud’s writings when he moved to the city to study and sculpt in his teens in the 1920s, reading Freud’s works in German. 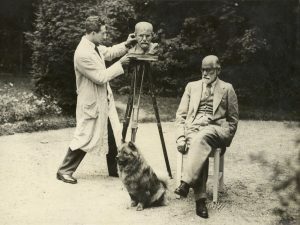 He approached Freud’s disciple, the analyst Paul Federn, with a view to sculpting Freud, but as an unknown young sculptor was turned down by Freud. Nemon then travelled on to Bruxelles, where he established himself as a leading portrait sculptor, changing his name in time to Nemon from Neumann. He was summoned back to Vienna in 1931 by Federn, who had secured provisional agreement for him to sculpt Freud for his for his 75th birthday. Freud remained doubtful, and Nemon sketched him initially in pencil in his garden, returning to the hotel to produce a preliminary clay overnight – which won Freud over. With Freud’s approval he continued to work during ‘brief sessions between one patient and the next’, finding Freud ‘reserved and uncommunicative’, as Nemon notes in his unpublished autobiography. Freud was nonetheless deeply pleased with the finished portraits, variously in carved wood, bronze and plaster, and chose to keep the wood carving for himself, which is now on display in the Freud Museum in Hampstead. 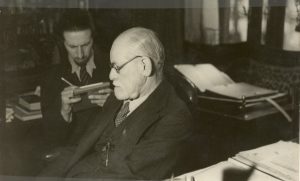 The initial portraits of Freud, visible also in photographs of Nemon’s Brussels Studio in the 1930s, show him in glasses, but Nemon continued to return to his subject over the years, visiting Freud each time he passed through Vienna on his way back to Osijek, and finally in London in 1938, both men having been obliged to leave Europe. 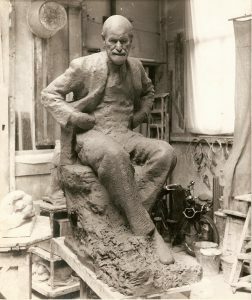 These later sittings would lead to a final, harsher more abstracted portrait, a terracotta of which remains in Nemon’s studio, and which became the head for the seated bronze now sited in Hampstead near the Freud Musuem. 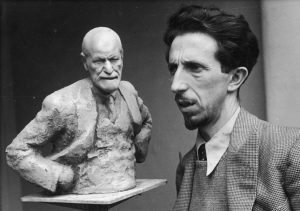 Archive material relating to Nemon’s sculptures of Freud — sketches, photographs, correspondence — is held by the Henry Moore Institute in Leeds, and the Freud Museum in London, having been donated by the Nemon Estate. Nemon believed that the vocations of the portrait sculptor and analyst were closely allied. In his portraits of Freud, Winnicott, Ernest Jones and other analysts, he sought to create studies which are informed by, but travel beyond, the sitter’s published works and public personae to challenge the viewer to see them in a new light. to my great surprise I have received the small bust of my father as a present from you in Lucerne and I thank you most sincerely for the extraordinary delight that you have given me. The bust is admired by everyone who sees it. To me it appears — I hardly dare say this — even more human and animated than the larger one. My brother says that the small bust can be re-ordered from you. May I do this on the present occasion? I would like to give it as a present to my sister and would be delighted if I could receive it for October the 16th [her birthday]. In case this is not possible I will keep the present for Christmas. Once again please accept my most sincere gratitude. Anna Freud [translated from the German by Katrin Wehling]. Freud’s housekeeper, Paula Fichtl, commented that the sculptor had made the professor look too angry. Freud’s response was: “But I am angry. I am angry with humanity.” [The Diary of Sigmund Freud, 1931 edited with notes by Michael Molnar]. Nemon’s portraits of Freud are now available through the Estate of Nemon website and are on sale at the Freud Museums in London and Vienna.